Grapefruit diet of the 1980s – begone! This power-packed fruit can do much better for you and your health when eaten in a proper balanced diet, and used as an essential oil to help treat various conditions and symptoms. This citrus fruit is packed with antioxidants, nutrients and healing properties you can take advantage of to combat digestive problems, stress, and even yeast infections. Essential oils are made by distilling, or extracting the beneficial part of the plant - in this case the grapefruit's leathery skin - and soaking it in oil to transfer its properties. This grapefruit oil is going to help you combat some of the most common ailments in a way that is all natural. Check out the list below to see how this essential oil could help you. *It's important to note that grapefruit essential oils can cause skin irritation if the area treated is exposed to direct, and strong sunlight. So avoid the sun after using grapefruit essential oil, or be sure to wash it off. Use this essential oil to help heal bruises and cuts, as well as diminish acne. Organic Facts explains that the antimicrobial properties of grapefruit make this essential oil great to help treat everyday ailments and keep the wound from turning septic or developing tetanus. Dr. Axe says this essential oil has antifungal properties that help reduce yeast and bacteria. The oil might even be able to reduce the yeast that causes candida virus - which causes gut problems, and can even cause cravings. Grapefruit essential oil has also been shown to help fight urinary tract infections with antibacterial properties that have been compared to that of modern medicine, according to Dr. Axe. However, that doesn't mean you shouldn't seek help from a healthcare professional for a serious infection. Like all citrus fruits, grapefruit is packed with vitamin C which is full of antioxidant components. Mercola says these antioxidants are tied to helping boost the immune system, combat premature aging, and even help with vision and hearing loss. Grapefruit oil's antimicrobial elements can help eliminate harmful bacteria found in food, and water. Dr. Axe says the essential oil is typically used to help fight skin infections, funguses, mold and parasites. Mercola notes it can also help rid the body of microbes in your gut, kidneys, and excretory system. Livened Up explains that grapefruit essential oil can do more than curb excessive eating, it can also help curb cravings that can derail your healthy eating habits. Take a few drops throughout the day to help keep your mind and body on track. Dr. Axe suggests inhaling the grapefruit vapors - possibly in a home vaporizer, or even an oil burning candle - to help fight depression. 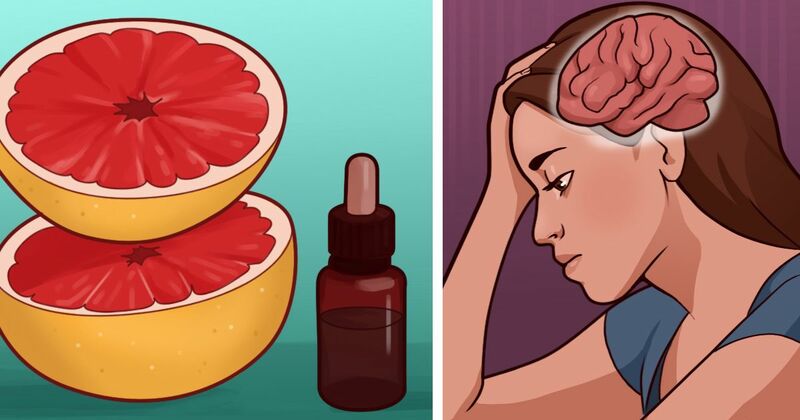 Organic Facts explains that grapefruit oil helps with depression by stimulating certain hormones in the brain, and by relaxing your body through aromatherapy. Dr. Axe says that the smell of grapefruit helps uplift, and is clarifying - which stimulate the mind. Try adding it to your bath, diffusing it in a home vaporizer, or even wearing it on your wrist or neck as a perfume to help keep you feeling less stressed throughout the day. Dab some grapefruit oil on your stomach to stimulate digestive function as suggested by Livened Up. Dr. Axe says it'll help bring more blood to the digestive tract, which helps detoxify, shed excess fluid, and fight microbes. Mercola says the invigorating smell can help relax you during painful hangovers, but Dr. Axe says it's also great for stimulating your hard-working liver and gallbladder. Putting a few drops of grapefruit oil in your water can be helpful, as can diffusing it in your home or applying it to your throat and neck. Share all the ways grapefruit oil can be helpful with your friends on Facebook.